Team Ireland are IGRF World Champions. Ireland wins the team World Championships in Gallery Rifle Centerfire and Smallbore in a very competitive match against Teams from Great Britain, Germany, South Africa and Australia. Ireland also won the individual world championship in both centerfire and smallbore to make it a clean sweep on the first occasion of holding the IGRF world championships in Ireland. Irelands Jeff Kehoe won Centerfire and Irelands Ray Holohan won Smallbore individual world champion. 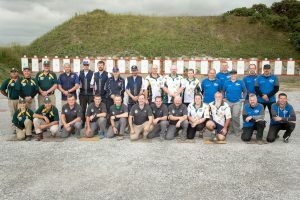 Midlands National Shooting Centre in Offaly hosted the international competition with competitors from the 20 NASRPC clubs in Ireland attending and from countries around the world. The IGRF World Cup and Irish Open was a great success with all of the nations commending the venue, Irish hospitality and professionalism of the organisers and Range Safety Officers. The NASRPC would like to thank the overseas teams and individual competitors for travelling, and the Irish competitors for giving them a great Irish welcome. Ireland is already looking forward to travelling to the next IGRF World Championship in South Africa in 2019 to defend their title.